A little over 15 years ago, several musicians in Bristol churches came together and started to build up music work in prisons. Changing Tunes is the charity that grew out of their work. It uses music – teaching, rehearsing, recording, performance, and composition – to aid the rehabilitation of prisoners and ex-prisoners. The shared experience of making music provides prisoners with opportunities to build friendships and to discover a sense of self-esteem. Lives are transformed: 61% of prisoners re-offend within 2 years of leaving prison, but for those participating in a programme with Changing Tunes the level is much lower – around 15%. We are usually based within the prison chapel. 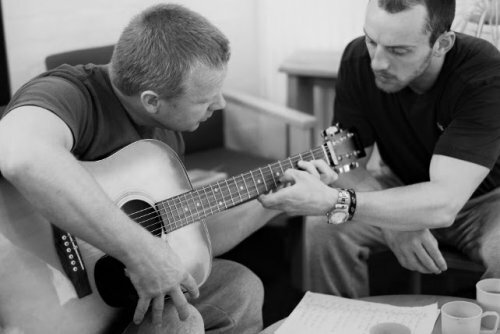 Each week we lead sessions enabling prisoners to learn, practise and perform music which inspires them. We see on average four or five prisoners at a time, often working towards performances or recordings that serve as milestones for each participant to measure how far they have come. Performances in front of other prisoners and staff are a chance to celebrate the results of hard work and practice. Sometimes we make recordings so that the prisoners can critique their own work and also take pride in it. A number of our participants have also sent recordings of the songs they have written to their families – sometimes to family members they felt unable to talk to, which has resulted in restored communication and a potential for reconciliation. While music cannot directly address many of the challenges ex-prisoners face, it can make a significant impact by striking at the heart of underlying issues. Music is uplifting and can dramatically alter mood and one’s perception of the world and self. The anticipation of regular music sessions drives motivation, which carries over into other areas of life. Performing in front of an audience leads to improved presentation skills, and confidence in one’s abilities. 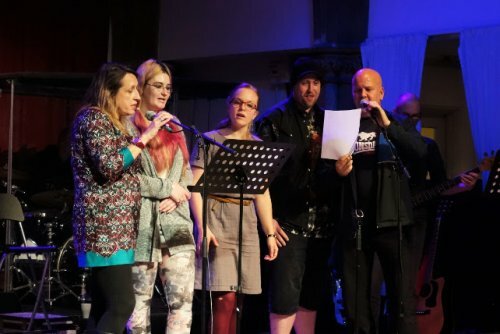 Musicians from Changing Tunes and ex-prisoners who have participated in the music groups will be present during the Birmingham Hidden Treasure weekend. They will contribute both to the One Day Programme with 16-18 year-olds, and also the “Prisons and Community” workshop. Changing Tunes is currently working in 12 UK prisons, mostly in southern England. Recently some work in prisons in the Midlands has begun. Concerts inside prison are generally attended by other inmates and prison staff too. They are nerve-wracking events for those involved! But they are also hugely rewarding and we often notice a marked difference in the performers’ confidence the week before and after the concert. Imagine you have been in prison for a number of years; all your friends are there – other prisoners, officers, chaplains, teachers etc. Then one day you’re removed from all these people, and from a fixed regime, to freedom and responsibility. Add to that the fact you will be unlikely to have a job (only 36% of prisoners go into education, training or employment on release) and there is a good chance you are homeless (30% of ex-prisoners are). Following prisoners’ release, we continue to work with those who wish – through concerts in the community, music sessions and pastoral support. Last year we held over 300 post-release sessions with ex-prisoners, including many concerts. “I went to prison in December 2002, and I was pretty broken, damaged, and empty. Prisons are full of people in the same situation. People who have made bad choices - not people who are necessarily bad, but just have had issues in their lives that they’ve been unable to deal with. My way of coping with the emptiness was by using drugs and alcohol. But slowly, through working with Changing Tunes that emptiness started to fill up, and it made me feel like a whole person - somebody treating you like a worthwhile human being for the first time in a long time. It isn’t just about the music. It’s about the relationships that are built up - that therapeutic relationship between the workers and the people who attend the groups. For me, Changing Tunes helped me to build my self esteem and my confidence, it helped me to believe in myself because these people were the first people to actually believe in me.